The man pulled up Hermione on her feets so she could stand up. " Ouch! Take it easy I haven&apos;t stood since I got to this God forsaken place" Hermione mumbled. " Be quiet!" The voice hissed. " Hermione..!" Parvati said with a weak voice and tried to reach for her. " Don&apos;t worry Parvati" Hermione said. " I&apos;ll get us out of here, I promise"
Paravti didn&apos;t have time to respond until the door shut close. Ginny woke finally woke up in her cell, she had no idea where she was and didn&apos;t know what would happen in any minute to her. She heard voices outside the door and tried to make herself heard, but her voice wouldn&apos;t work. " H-hello...?" She tried. But in some way she made herself heard, the door swung open.
" This one is awake" The man mumbled. " I&apos;ll go and take the other one then. &apos;The other one.....?&apos;Ginny thought to herself. Did they mean Hermione? Oh no.... She tried to stand up and find her balance. The man grabbed her arm and pulled her cloer towards him- " What do you think you&apos;re doing?" Ginny spat. " I already have..." " ...a boyfriend? Yeah I know" Ginny&apos;s eyes got wide open. First she thought the man had stalked her or something, but then it clicked in her head. He always had.
" Blaise?" The man pulled away the hoodie from his head and smiled at her. She flew into the man&apos;s arms and he hugged her tightly, a discreet tear of joy fell from his left eye. " I&apos;ve missed you so much, I&apos;m sorry I couldn&apos;t save you before" He whispered. Ginny sighed and wiped away his tear. " You&apos;re here now, that&apos;s all that matters" Blaise kissed her deeply on the lips and wrapped his arms around her tighter than ever. " Where is Hermione?" She asked worriedly. " I don&apos;t know. I think Draco is looking for her"
Hermione was led out by a death eater and tried to keep calm. Sometimes she heard sounds in some corridors and that scared her because she didn&apos;t know who or what caused the sounds. " Can you tell me where you&apos;re taking me?" " You&apos;re going to meet my boss" The man said. " What? Why?" She said confused, and tried not to sound nervous.
" He will have a fun time with you, like he did with the rest of your so called army" The man said, and this is where Hermione took her chance. She easily slipped away from the man&apos;s grip and ran for it. She had no idea where she was running, but she ran.
" Come back, you filthy..." But he couldn&apos;t finish the sentence because someone hit him with a powerful spell.
" Don&apos;t you dare call my girl that" Hermione heard Draco&apos;s voice say with an angry tone. She turned around thought she was dreaming. But no, this was so real it could be. He actually stood there with his wand pointing at the man who laid on the floor.
" D-Draco? You&apos;re here...?" Hermione whispered and thought she would start crying anytime soon. " I&apos;m here, Hemione" He grabbed her by the arm and pulled her towards him. She was just about to sink into his arms when a spell was right into Draco&apos;s hand and he dropped his wand.
" Well, isn&apos;t it Lucuis Malfoy&apos;s only child? Standing in my house with a mudblood in his arms?" A big and tall man with a dark robe and brown hair and brown eyes said. " Mr Malkins" Draco said.
" Tell me, Draco, why are you here? Trying to ruin my fun here?" " Believe me, I will ruin more than that for you" Draco said harshly. " You&apos;re trying to exterminate the whole Army of Dumbledore!" Hermione yelled. " You have the other prisoners here too somewhere. Draco, Paravati is dying, we have to help her"
Mr Malkins pointed his wand at Hermione. " Not so fast, my dear" Draco quickly stepped in front of Hermine so the wand was pointing at him instead. " I will have a little fun with you two first" He shot Cruico at Draco who immidiatley fell to the floor and whimpered in pain. Malkins suddenly fell to the floor without a sound and the Crucio curse disappeard from Draco. Hermione looked around and tried to realize what the hell was going on. Then she saw Ron and Pansy ran towards her. " Ron?!" She breathed. " Hermione, I didn&apos;t kill him. Kingsley, me and Harry will deal with him later. We and the others will find the rest of the D.A. 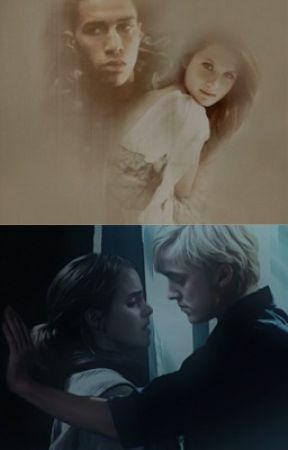 Take care of Draco"
Without doubt, Hermione ran towards Draco and sat down on the floor and tried to help him up. 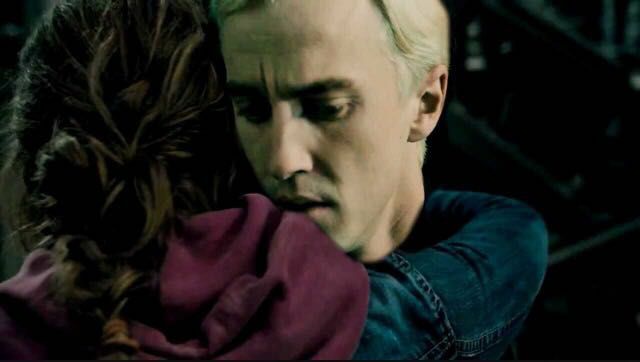 Draco took her in his arms and held her closely. " I&apos;m so sorry i left you" He mumbled against her head. " I&apos;m sorry for kicking you out. I was so stupid" Draco shook his head. " No Hermione, I understand. I shouldn&apos;t have left you like that. Oh my god, please..."
Without thinking, Hermione kissed him deeply. " I can&apos;t believe you came back for me" She whispered against his lips. Draco chuckled.
" Wether we&apos;re together or apart Hermione, I&apos;d come for you anyway"